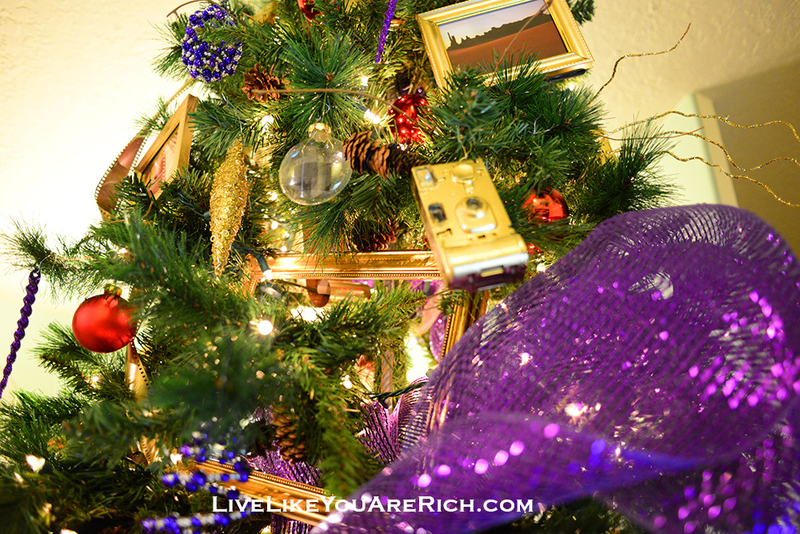 How To Decorate Your Christmas Tree Like a Pro. This Christmas we donated a tree to the Festival of Trees. It is a non-profit charity that donates all the money raised to the Primary Children’s Hospital. The trees are sold and need to look as professionally-decorated as possible. Many decorate using a theme and others just decorate based on color schemes. This year we did a photograph themed tree using my kid’s dad’s photography. 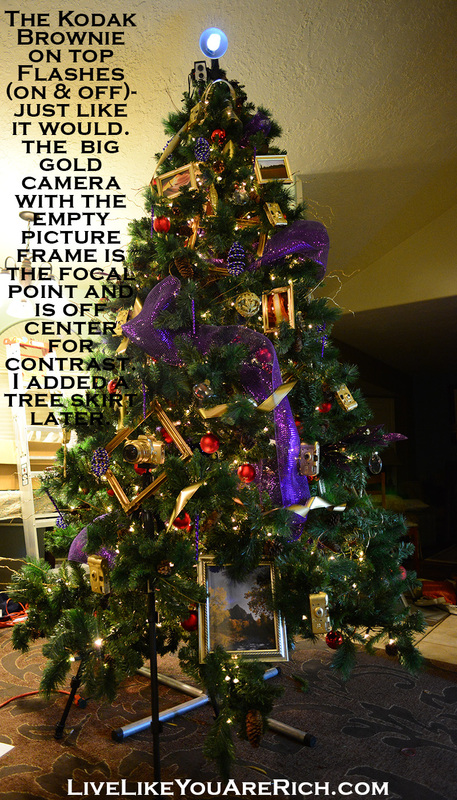 When it came to decorating a Christmas Tree, I had never learned any rules of what to do and what not to do. 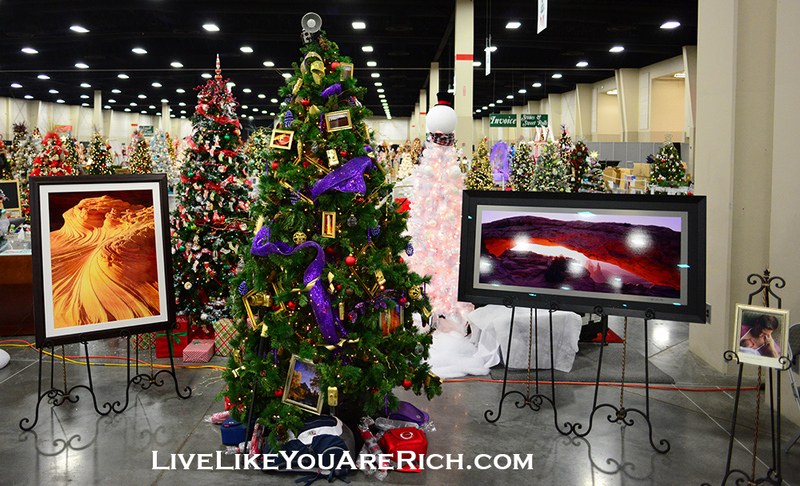 I attended the Festival of trees decorating class and I learned a lot. I also did research online and for more information I actually went to see and speak to multiple professional tree decorators. 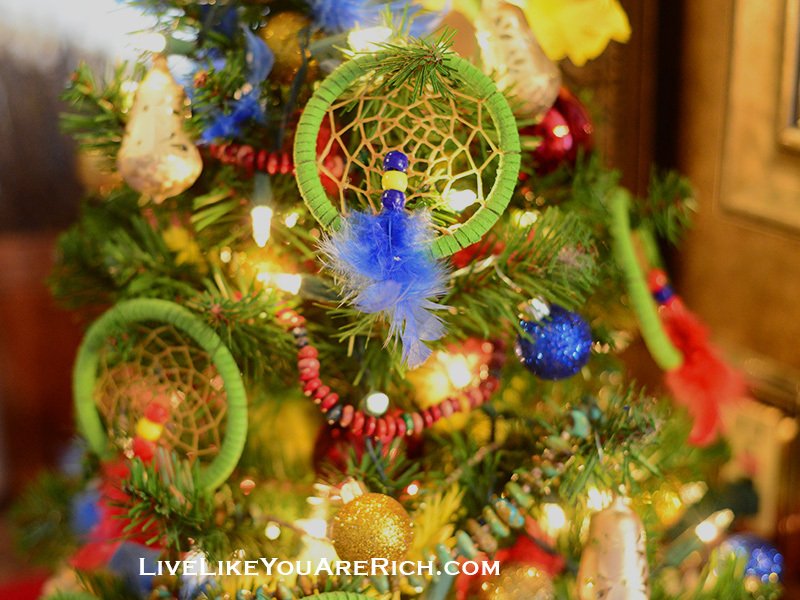 I took notes and used the techniques they taught me on the 10 ft tree we donated, the 7 ft tree we own, and a little 2.5 ft tree that I decorated with a Native American theme. 1- Prepare the tree and ornaments. Make sure the lights are working. 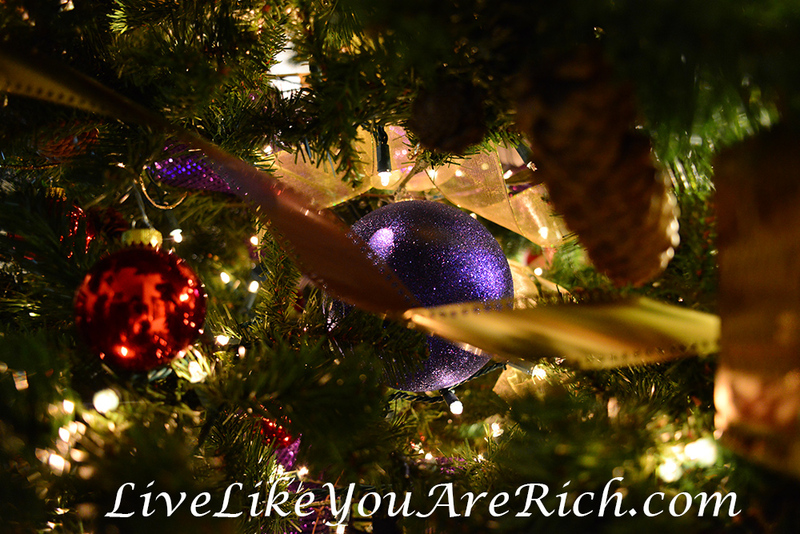 Fluff up your tree by spreading each section’s branches out. Separate the ornaments by size. Largest to smallest. 2- Put the decorations on. 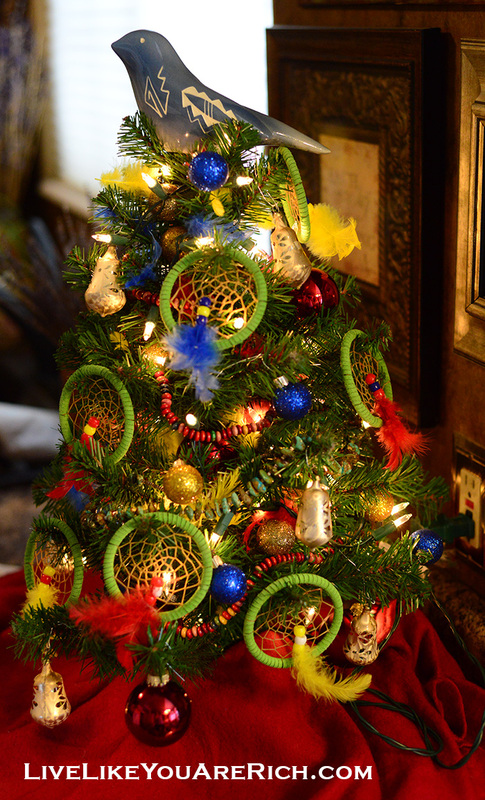 If you are wanting to use Deco mesh, (as I did on the big tree and our home tree), apply it before the ornaments. Medium ornaments should be hung midway between the trunk and the smallest on tips of the branches. 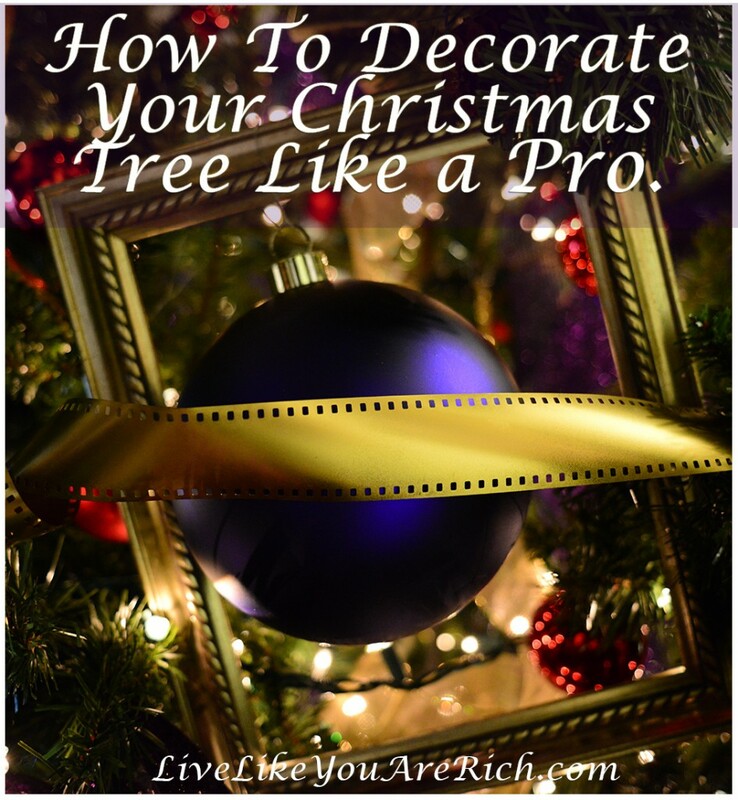 Next, you should hang the Christmas Tree garland, ribbon and other décor. Start from the top of the tree and work your way down with garland and decorative inserts such as branches, bows, etc. 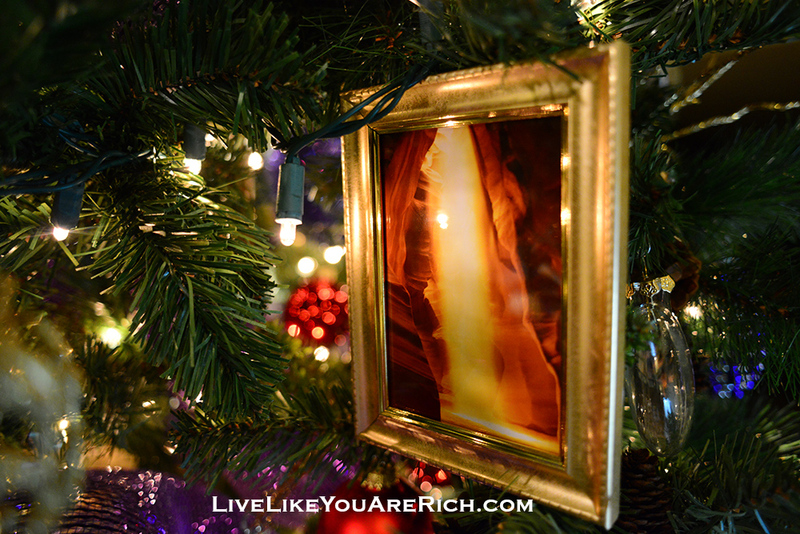 Hang the smallest ornaments and the centerpiece/detail ornaments on the ends of the branches. Add the star or other objects on the top of the tree. Use large items to add more height. Branches sticking up, huge candy canes rising above the tree etc. I used a Kodak Brownie camera and my dad who is really good with electronics was able to rig it to flash like a camera flash. On the Native tree I used a native bird carving, and on our home tree I used a traditional star. Add height to the top of the tree if there is room for it. Finally, apply a tree skirt to hide the tree stand and finish the look. 4- Use different widths and textures of ribbons for bows and garland. (I used 3 different types of ribbons, deco mesh, and also camera film spray painted gold). 5- If you are doing a themed based tree think outside the box. Don’t do too much matchy matchy or predictable décor. Research online, look around and try to think of a theme and ways to do the theme in more unpredictable manner. (Below I used dream catchers, coral beads, turquoise, Native patterned ornaments, and feathers, with a Native bird carving on top). 6- Don’t put too many of one type of ornament or color or decoration in the same space, spread them out. 7- If you have a lot of kids or dogs. Make sure not to put valuable items near the ground. Have them higher up. 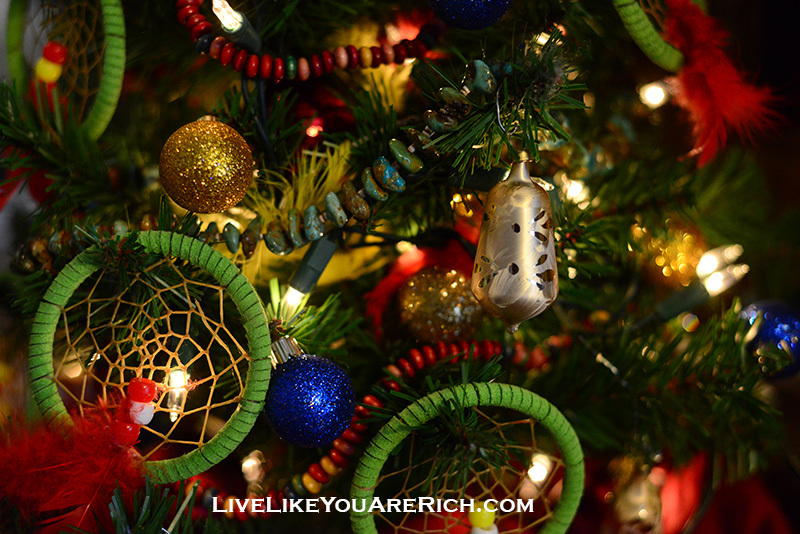 Buy plastic non-breakable ornaments for the lower areas of the tree. 8. Use colors that look great together. If you are unsure, pick one color and Google what colors will go with it. This is the completed tree we donated. We named it Yearning for the Light. We dedicated it to our good friends’ baby girl who passed away a few months ago. Here is the YouTube link if you would like to see all sides of the tree. Love your decorations for decorating the tree, but I especially love the Brownie camera. I still have mine from my childhood and would love to be able to light it like your father did. Any directions on how he did that? I went to a Christmas store and they had a lighting section. I bought a bulb that flashes. Then I got a wire that you connect to the bulb. We opened the brownie, put the bulb in place of the lens and ran the wire from the back out of it down the tree trunk and plugged it in. The camera has its own strand of cord. It really wasn’t too difficult. Although he did most of it. I bought everything and saw how he did it. We wired the brownie to the tree. Happy decorating! I have an tree that’s about 7.5 ft tall. I have normal or regular sized ball ornaments, but id like to add 4-5 jumbo or just big ones to it, but I’m really unsure of what size those would be…I’ve spent all morning searching this, but have unfortunately found myself without an answer. I found your site to not only be creative but smart! So, I thought it couldn’t hurt to reach out and ask you. 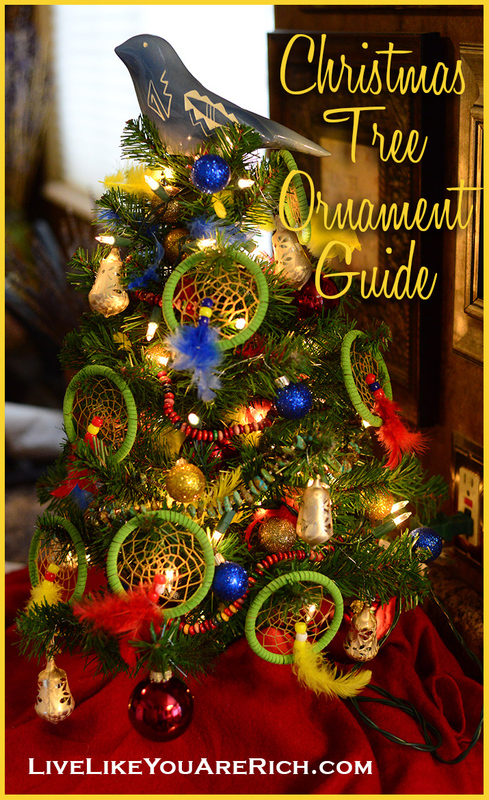 I would do 3 or 4 5″-8″ ball ornaments set deep inside around the lower half of the tree. Then get smaller and work your way out and up. Just an opinion though. I’m sure whatever you decide will look gorgeous!